Retro Wreath Wedding Design artfully engraved personalized with First name, wedding title, and a wedding date. Perfect gift for all the important wedding party guests, groomsmen gift, bridesmaid gifts, ring bearer, mother of the bride..., and anyone else attending! Artfully crafted in our Florida Keys Studio. 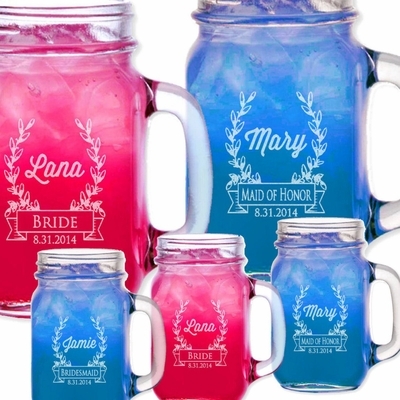 One Personalized Mason Jar. Color: Clear Glass. Size: 16 Ozs. Diameter: 2 1/2" & Height: 5 1/2" Dishwasher safe. Not for canning or for hot liquids.